During an hourlong cable show I recently watched. there were ads for three different brands of yogurt. In 2016, Americans spent $7.7 billion on yogurt—up 20% from 2011. Your yogurt shelves are fuller than ever with varieties named after all sorts of countries—Greece, Australia, Iceland. With mix-ins, fat-free, and other options, choosing a cup of yogurt for breakfast is no simple task. 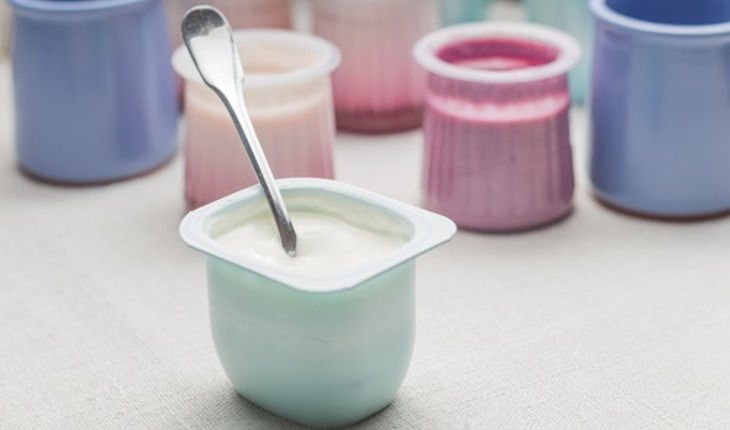 There are three main nutrition areas to consider when you look at a yogurt label. Even a food with lots of health benefits can be tricky. But the calcium and cultured properties of yogurt make it a great choice for smart women to include in their diet. All yogurt has sugar in it in the form of lactose. What you want to watch out for is added sugar that comes when adding flavors. There’s nothing wrong with strawberries and Greek yogurt, but when you add fruit yourself you aren’t soaking it in fruit juice or other sugary syrups. That’s why dieticians recommend buying plain yogurt and sprucing it up at home. The University of Kentucky’s Gill Heart institute warns that one serving of flavored yogurt can contain half of your recommended daily sugar. You should be aiming for 10% or fewer of your calories coming from sugar; that means 25 grams a day. The stronger taste of Greek yogurt is often masked by added sugar so label checking is especially important here. Greek yogurt takes four times as much milk to make as regular yogurt. The straining process that makes it firmer also lowers the carbohydrates and increases the protein content. If you are looking to get more protein in your diet, switching to Greek yogurt is the way to go. Dr. Zhiping Yu, assistant professor in the Nutrition and Dietetics program at the University of North Florida, says that 6 ounces of Greek yogurt contain 15 to 20 grams of protein, double what American style yogurt has. Icelandic yogurt, like the brands Smari or Siggi, is made similar to Greek style and has 17 grams of protein per serving. It is thick and creamy, typically with less sugar than commercial Greek brands. Those extra creamy yogurts you’ve fallen in love with? Most of the time they are made from whole milk. That’s going to mean more fat from start to finish. Nonfat and low fat varieties are easier to find in traditional yogurt. Sheep milk is most common in other parts of the world, but yogurts made from this dairy product are popping up in the US. Sheep milk has a lot of solids in it, making it good for cheeses and yogurt more than drinking. But that also means it is high in fat. Fage Greek style yogurt offers a wide variety of lower fat options; many brands that advertise low or no fat balance that out by adding sugar to improve the taste. Australian style yogurt, like the Wallaby brand, is a bit stronger and creamier than American yogurt but less powerful than plain Greek varieties. Chobani 100 calorie cups give you a lower fat and calorie count but you’ll want to watch the sugar levels. And if you are primarily interested in the probiotic properties of yogurt to help out your digestion, Activia Light is a good option.